One of the most compact and advanced mobile phones ever made, the Motorola RAZR V3 (sometimes just called the Motorola V3) introduces several completely new features into handset design, to create a phone that is not just technically clever, but also amazing to look at too. The Motorola RAZR V3 is incredibly thin - just 13.9 mm. Inside the V3 is a large, high-quality colour display with 176x220 pixels in 65,000 colours, plus a smaller 96x80 pixel external display and a 640x480 pixel resolution camera with 4X digital zoom. The case on the Motorola V3 is made from aluminium, to make it strong but lightweight, and the RAZR V3's keypad is has been chemically etched rather than assembled for maximum precision. 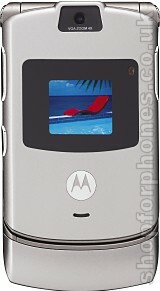 The antenna is concealed within the case, giving the RAZR V3 an even sleeker look. But there's much more with the V3 than just a pretty case and nice screen. The RAZR V3 features Bluetooth connectivity, quad-band GSM for use anywhere in the world, GPRS for data, Java for games and other applications, 3D graphics acceleration, plus of course polyphonic ringtones and a range of personal organiser applications to keep you up-to-date on the move. Overall, the Motorola V3 measures 13.9x55x98mm and weighs only 95 grams, meaning that Motorola have managed to cram a huge amount into a tiny form factor. One day perhaps, all phones will be made this way. In the meantime, if you want the thinnest and possibly coolest clamshell on the market, then the Motorola RAZR V3 is for you. If you want more information on the Motorola RAZR V3, subscribe to our mailing list. Also, the Update newsletter contains general news about new phone releases.